The PX1004UL – simply “install & forget”. First grade high end blue laser diode light source, combined with an unique quality Phosphor wheel technology and no filter replacement required, results in an up to 20,000 hours hassle free operation. These features, bundled with a low overall power consumption, provide exceptional reliability and an attractive total cost of ownership addressing long lasting Signage installations or Museums. · Resource-saving – up to 20,000 h maintenance-free operation thanks to Laser Light Source technology, filter less dust shielded design & integrated liquid cooling system. · Hassle-free Installation – wide zoom bayonet lens portfolio & support of third party lenses (ask your local trusted NEC partner) enables customised installations and easy replacement of current installation projectors. 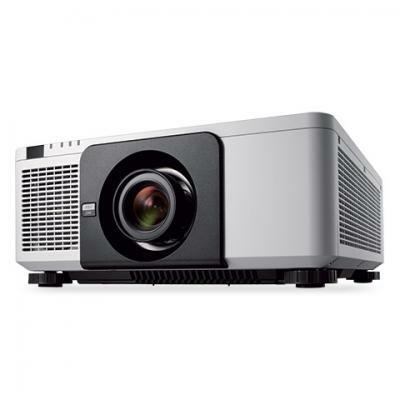 · Outstanding Picture Quality – whole new visualisation experience with high brightness, up to 4K input signal and unique picture & colour processing technology based on the latest NEC scaler chip. · Easy Way to Large Viewing – use the OPS slot for built-in players, HDMI-out signal loop-through, built-in signal splitter and edge blending capability to provide large presentation pictures. · Maximum Flexibility – 360 degree installation in any direction, unique geometric adjustment, Picture in Picture and 3D support offer unrivalled installation capabilities for any application. · Cost Saving Device Management – save effort whilst administrating all connected NEC devices from a centralised location by using the NaViSet Administrator 2 software tool. Maximum: 1,270 / 500"; Minimum: 100 / 40"